If you are tired of dragging yourself to the gym and love the idea of getting a high quality workout in the comfort of your home, a home gym may be right for you. To get started you must first decide on which of the many gym flooring options best fits your space and your needs. With so many types of fitness flooring available this can be a confusing task. To decide which flooring best fits your needs simply follow the easy steps below. First, what are your fitness goals ? Are you looking for a basic gym and want to put an elliptical or treadmill in the corner of a bedroom? In this case, all you will need is a simple rubber or foam equipment mat to go under the equipment in order to protect the floor. If your goal is to create a full workout room with cardio and strength equipment, you will need to cover a larger area and look at a more durable rubber floor such as the ones commonly used in commercial gyms. Next you will need to decide on the look you are trying to achieve. Is it important to you if your home gym matches the colors and design of your home or is it going to be in the corner of the garage or basement where functionality is far more important than design ? There are rubber flooring options that range from basic black to bright colors that can match almost any décor. Now it is time to look at the budget. Since there is such a wide range of home gym floor options a few simple rules apply. Generally the thicker the flooring and the brighter or bolder the colors the more expensive it is. 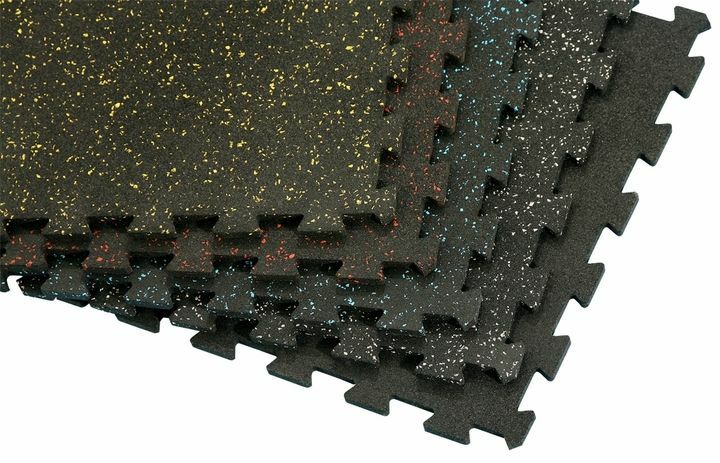 Solid black rubber flooring and mats are the least expensive and usually made from recycled material. Usually these mats and flooring come 3/8 of an inch thick which is a good choice for home gyms.